This content is intended for those who are experiencing screen flickering issues with their Samsung Galaxy S6. Screen flickering problem is typically caused by a faulty hardware like when a device was dropped and/or physically damaged after a strong impact. Mobile devices like tablets and smartphones are prone to this problem given their sizes. As a matter of fact, two of our readers have relayed to us similar problem on their Samsung Galaxy S6 screen which according to them flickers and the display colors turned pink with almost inverted display. In most devices, pinky colors and black spots on the display usually occurs when there's a loose cable or LCD wiring faults on tablets. Same thing can also occur on smartphones including the S6. Unfortunately, hardware problems like this can only be resolved by a technician. This means you need to take your phone to a repair shop for hardware checkup and repair. But if you are highly skilled on such tech-stuff and possess enough guts to do the repair by yourself, then you can try to open the phone, check the connections, and secure those that you found loose. Just remember though that doing this will void your phone's warranty. 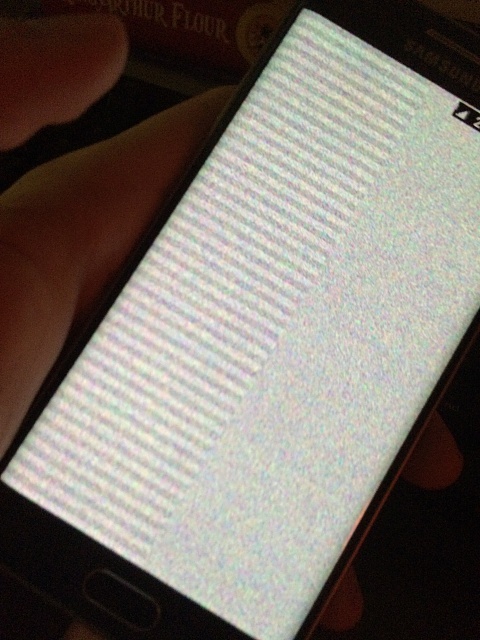 On the other hand, screen flickering problem can also happen due to a software glitch like a buggy application. There are also some cases when the display flickers after updating the device software. Apparently, it's the update that's triggering the problem. If the problem happens after installing a new app, then try to temporarily disable the app and see if it'll fix it. Once you've proven that the newly installed app is causing you this trouble, then you can decide to either remove the app or contact the app developer to escalate the problem and have them fixed it. You can also try running the device in safe mode to see if other third-party apps are triggering your phone to act this way. Turn the phone back on while pressing and holding the Volume Down button. Keep holding the Volume Down button until you see the Home screen displays. When the Home screen loads, you should see Safe Mode at the lower left corner. This indicates the phone is already running in Safe Mode. In this state, all third-party apps are temporarily disabled. Observe your phone for a few minutes and see if the screen still flickers without all third-party apps. To get out of Safe mode, just power off the phone as you normally do by pressing and holding the Power button, and then select Power Off from the given options. In case the screen flickers after performing an update, try to reboot the device (soft reset). If a soft reset won't do any good, then your last resort would be a master reset, which will restore device to factory defaults. Please note though that all your personal information and customized contents stored in your device will be erased in the process. So you might as well consider backing them up beforehand. If a master reset is not your choice and the problem happens after updating your Galaxy S6 firmware, then you may contact Samsung Support or your carrier to escalate the issue and ask for recommendations. For more problem solutions and troubleshooting guides, please visit our http://stephaniefulke.blogspot.com /2015/07/Samsung-Galaxy-S6-Troubleshooting.html" target="_blank">troubleshooting page for Galaxy S6 device. we feel the information How to Fix Samsung Galaxy S6 Screen Flickering Issue that's all. hopefully the information How to Fix Samsung Galaxy S6 Screen Flickering Issue that we have conveyed can provide benefits for you and all visitors of this blog, if any criticism and suggestions please comment. you just read How to Fix Samsung Galaxy S6 Screen Flickering Issue if this article is considered useful and you want to bookmark and share it please use the link https://stephaniefulke.blogspot.com/2015/08/how-to-fix-samsung-galaxy-s6-screen.html and what if you want other information look for another page in this blog.